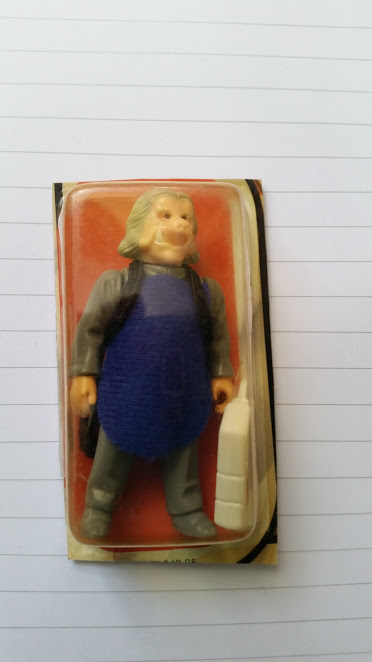 I have this Ugnaught figure on a cut card which I bought about 12 years ago and it's been sat in a box ever since. The bubble lifts one side but the figure cannot be removed and the white case is still taped to the bubble. I realise that opening figures is frowned upon and can result in bans in some circles but this is a bit different. I can't display it with a loose collection and I can't display as a MOC so what would you do? b; Open it and get graded or display it. c; Sell it and buy one that's already loose. Me personally if I really couldn't display it then i'd sell it to a collector who would prefer to keep it the way it is, and then use the money to buy a mint loose one or add it towards getting a MOC. Surely the cut card can still be displayed though?, like in a nice little GW acrylic case?, it would look nice I reckon! 'a' or 'c', but never 'b'. There are people who collect cut card figures and there are plenty of loose figures in just as good condition. One of the members here (punkpat) was recently selling factory overstock Ugnaught figures which are in great condition. Leave it or sell it. That should be your only dilemma. Sell it and buy a nice MOC. Sell it and buy a good loose figure. or do the above, which is a nice compromise. Don't open it you'll find a loose mint figure if you give it time. I think it's nice just to keep it as it is even if the card was cut. Lol true. But it's well placed though! It is still mint and sealed moc even if the card is still only the size of the bubble, you can get a small acrylic case pack the back with bubble wrap to have the front of the bubble touching the front of the case.